This guide will give you an understanding how to choose each of these specifications correctly. Any label manufacturer should be able to print on a range of face materials. It should come as no surprise that paper is commonly used to make labels but different applications can need different materials. In the label manufacturing business, we call paper “vellum”. This is matt and untreated paper made from organic pulp. There are variations on this material that can be treated. Glossier finishes have china clay added to the paper during production. This gives a smooth finish and adds a sheen depending on the quantity added. We can use a semi-gloss or a full gloss paper. Semi-gloss is predominant whereas full gloss paper used more rarely. Paper can also be treated with thermal pigments for thermal printing – commonly used for print on demand applications such as courier labels or sandwich or food labels on rolls. Label printers predominantly use thermal printing for speed and reliability. Thermal papers contain a pigment that is cured by heat. When the pigment cures it darkens to create a black discolouration on the paper. Coupled with specialist software, the printer can interpret designs and generate complex images at speed. Thermal papers are available in black or specialised colours. It is also possible to have multiple pigments on a single label. Thermal Transfer printing uses a ribbon of wax, resin or a mixture of wax and resin. The ribbon passes by the print head of the printer at the same time as the label. The head from the print head de-laminates the ribbon and heats the wax or resin which adheres to the paper label being printed. This process of using a thermal ribbon means that you do not have to use direct thermal papers. Thermal transfer printing can be done using plastic materials too. When a man-made material is used, wax tends to give a poor performance so resin ribbons are used for this. Resin ribbons are dearer than wax ribbons. Whilst paper is used extensively, plasticised materials offer properties that are ideal for some specific applications. Plastic materials can offer superior waterproof performance and are ideal for garden centre labels, chemical labels and other applications where durability and resistance are important. Common plastics used are polypropylene, PET (polyethylene terephthalate – try saying that and keeping your dentures in! ), Tyvek and other trademarked products. There are four main adhesives used in the labelling business for your printed labels. You have to choose what you want based on the environment you expect your labels to be in. Peelable for when you want to be able to remove a label cleanly after it has served its purpose. An example might be a gift item or a card. Permanent for applications where you need the label to stay attached to an object permanently. Ideal for food packaging and general products. Freezer for use where a product is expected to be frozen at some time during its lifetime. Note that freezer adhesive will not work well where a frost is on the surface of the item when the label is applied. High-Tack for use in extremely rigorous environments and where labels may be subject to hard mechanical force such as tyres. 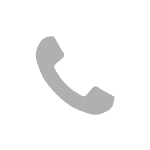 If in doubt, call us on 01332 864895 and we will talk you through how to choose. How are you going to be applying your labels? Hand applied or machine applied? If your printed labels on rolls are machine applied, we will need to know how the machine accepts printed labels on rolls as stock to apply to the product. We will then make the labels to meet that requirement. 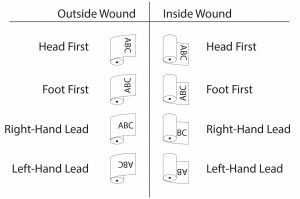 Inside wound or outside wound? How does the label come off the roll? If you look at the label in situ, there will normally be an up, down, left and right orientation that is easy to identify. As the labels come off the roll, do they come off left or right hand leading, head first or foot first? There are four main core sizes and we have tooling for each: 76mm (3 inch), 44mm (1 3/4 inch), 38mm (1 1/2 inch) and 25mm (1 inch). As a general rule, the longer the label, the larger the core. If you are printing say, sandwich or food labels that exceed 100mm, we would recommend moving to a 38mm core. Our sandwich label printers can take 25mm or 38mm core stock. To find out more – or let us hold your hand whilst you order, call us on 01332 864895 or fill in the form below and we will get in touch.